Photo of peregrine falcon in flight near Morro Rock by Kevin Cole. A peregrine falcon flies off of Morro Rock. Photograph courtesy of Steve Schubert. 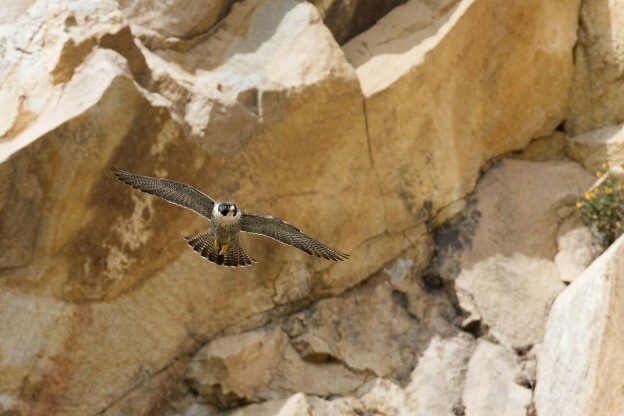 When peregrine falcons were added to the California Endangered Species List in 1970, there were only 5 pairs left in the state and Morro Rock was one of only two remaining nesting sites in San Luis Obispo County. Residues from the pesticide DDT in agriculture were largely to blame for the birds’ steep decline. At that time, DDT was a widely-used pesticide. It had first been synthesized in 1874 and was used during WWII to control a variety of diseases including typhus, body lice, malaria, and the bubonic plague. The 14-minute video above entitled “DDT, Weapon Against Disease,” was created by the U.S. Army Pictorial Services in 1945 and shared by the U.S. National Library of Medicine. It details the uses wide ranging uses of DDT during World War II. Though DDT was once thought to be safe enough to apply directly to people’s bodies for the purpose of lice removal, the pesticide is now known to be toxic to mammals including people. It can easily be absorbed through insect exoskeletons and accumulates in their fatty tissues in the fatty tissues of other wildlife. Because of this, it is passed up the food chain as one animal ingests another. This can cause big problems. This video comes to us from Perry Grin via Flickr. An average peregrine clutch contains between 3 and 5 eggs. As DDT residue entered the diet of the peregrine falcon through their prey—including shorebirds, ducks, and even pigeons—the birds’ eggs became thin, brittle, and prone to breaking under their mother’s weight. This led to the failure of many nests to produce chicks and spelled disaster and the high probability of extinction for the birds. DDT was banned for use in the United States in 1972. Lucky for these apex predators and the delicate food chains that depend on having them at the top, the University of California Santa Cruz Predatory Bird Research Group stepped in with a plan. 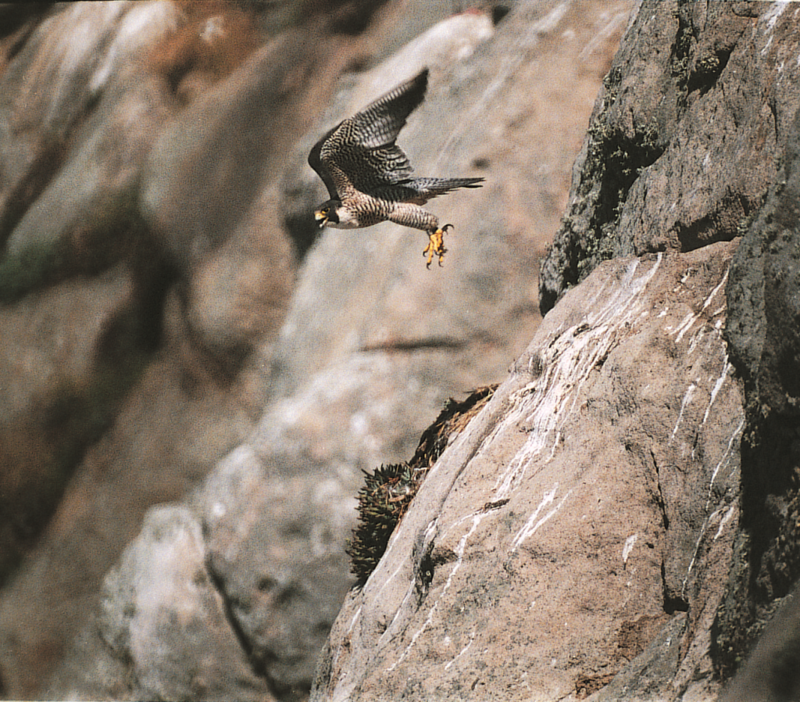 In 1975, the group began swapping thicker-shelled eggs from a captive flock of peregrine falcons that had not been exposed to DDT with the thinner-shelled eggs of the wild falcons. The female falcons were able to successfully hatch the thicker-shelled eggs while the researchers hatched the thin, brittle eggs in captivity and released the chicks when they were ready. 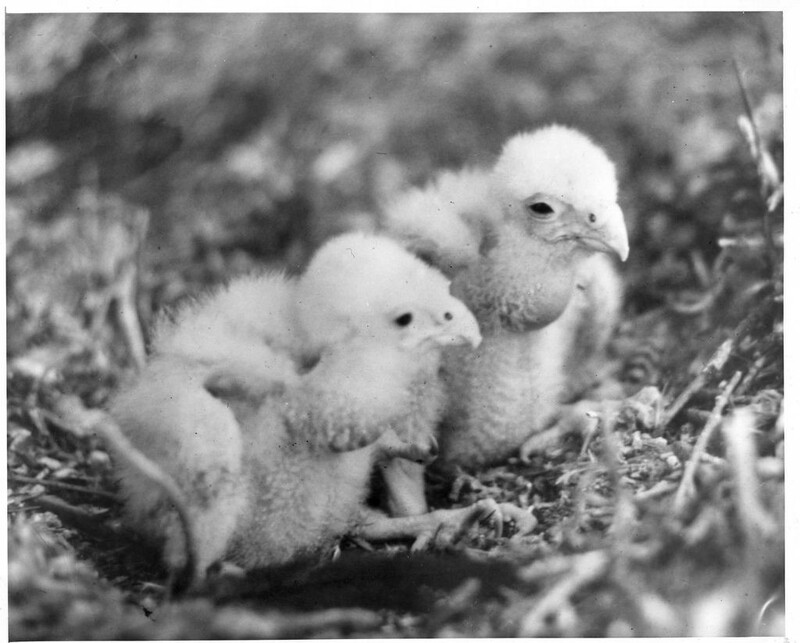 This photograph from 1977 shows Morro Rock Peregrine chicks in nest from a captive breeding program. Courtesy of Paul Andreano via Flickr. It is from the Morro Coast Audubon (MCAS) archives and was scanned by Steve Schubert. This program has been incredibly successful, fostering and releasing hundreds of peregrine falcon chicks. By 1999, peregrine falcons had recovered enough to be removed from the Federal Endangered Species list. They were subsequently removed from the California Endangered Species list in 2009. Two nesting pairs remain at Morro Rock. When you visit Coleman beach or Morro Strand State Beach, keep an eye out for stooping birds on the hunt. They go after shorebirds, some song birds, and the occasional pigeon. The larger females can take on bigger prey than the males. Starting in December, you might see courtship behavior, which is followed by mating. A month or two after that, we may have chicks again in Morro Bay. The video above shows the courtship flight of two peregrine falcons from Ontario. Are you hooked on the peregrine falcon story? Check out the following sites for more information.